Investors have always had a choice of strategies. This is true in the stock market where investors can buy large caps, small caps or midcaps. They can pursue growth, value or a variety of factors that are believed to capture different aspects of performance. The same variety of alternatives exists in the fixed income markets where investors can balance potential risks and rewards and the same is true in real estate. In fact, every asset class forces investors to select from various alternatives. Therefore, it is not surprising to learn that the cryptocurrency market, perhaps the newest asset class available to investors, also offers alternatives. Recently, bitcoin was the largest crypto with a market cap of more than $110 billion. The size of the market changes rapidly but the relative position of the largest assets in the category has remained fairly stable over time. The second crypto, by market cap, is Ethereum with a market cap of about $28 billion recently, about a quarter the size of bitcoin. In stock market terms, this could be a mid cap. 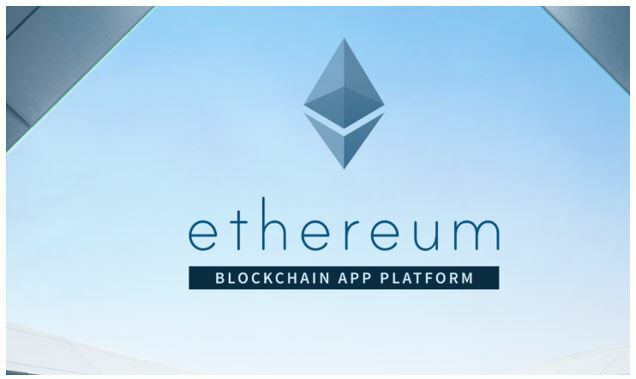 Ether is a cryptocurrency whose blockchain is generated by the Ethereum platform. Ether can be transferred between accounts and used to compensate participant mining nodes for computations performed. Ethereum provides a decentralized Turing-complete virtual machine, the Ethereum Virtual Machine (EVM), which can execute scripts using an international network of public nodes. “Gas”, an internal transaction pricing mechanism, is used to mitigate spam and allocate resources on the network. Ethereum was proposed in late 2013 by Vitalik Buterin, a cryptocurrency researcher and programmer. Development was funded by an online crowdsale that took place between July and August 2014. The system went live on 30 July 2015, with 11.9 million coins “premined” for the crowdsale. This accounts for about 13 percent of the total circulating supply. 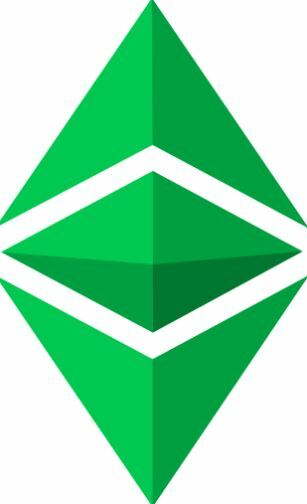 In 2016, as a result of the collapse of The DAO project, Ethereum was split into two separate blockchains – the new separate version became Ethereum (ETH), and the original continued as Ethereum Classic (ETC). Like many other cryptos, price changes in Ethereum are highly correlated to bitcoin. This is shown in the chart below. Ethereum is the green line and bitcoin is the orange line. 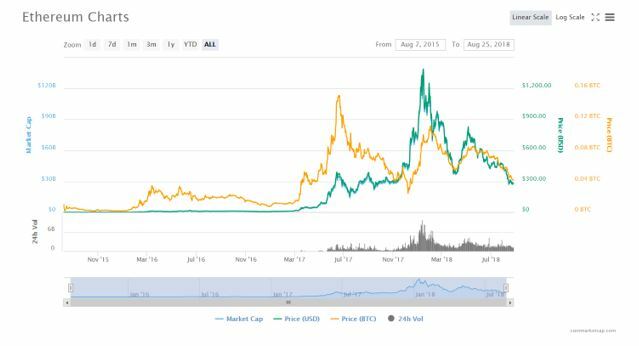 What could be of interest to traders is the fact that Ethereum is more volatile than bitcoin at times. Volatility is important to traders in any market. According to some experts, the underlying technology of Ethereum makes it more valuable than bitcoin. “Bitcoin was the first coin to ever operate on a blockchain network. Every transaction that takes place on Bitcoin’s blockchain is recorded in a “block.” This block is then attached to a long chain of blocks. In the case of Bitcoin, its blockchain is a public ledger. And what that means is anyone participating in the network can see the transactions taking place and the linked electronic signatures. That being said, Bitcoin’s use of blockchain technology is fairly basic. Ethereum uses the technology differently, offering more promise to both developers and currency enthusiasts. Ethereum is written in Turing-complete code language. For a computer to be Turing complete, it must be capable of running any algorithm. Because of Turning-complete language, any script can run on Ethereum. Ethereum’s blockchain records things far more rapidly than Bitcoin’s — processing transactions in 12 seconds, as opposed to Bitcoin’s 20 minutes. This makes Ethereum’s blockchain the best network to support any business or program. Its ability to solve problems with accuracy and precision has no rival. Etheremon is an example of the dapps possible with ether. It is “a decentralized application built on the Ethereum network. Etheremon creates a world of Monsters (or Mons) where you can capture, train, transform, and trade them with others. Of course, there are risks associated with Ethereum and the risks are the same that affect any crypto investment. There is the possibility that the entire crypto market could collapse but given the billions of dollars in the market, that possibility is considered remote by some. However, even if the crypto market and Ethereum survive in the long run, there is no guarantee that the price of any cryptocurrency will be higher than it is today. Although, technically, this is true of any investment, the risks of a price decline in the crypto markets could be considered to be higher than average. While the risks must be considered, it is possible that an investment in crypto could be right for many investors. In fact, the potential gains in this market are significant and that could make the risks acceptable to aggressive investors.